My cat Donut has a knack for finding the strangest places to take a nap. And I really need to finish that Michael Chabon book, it's so good. 1. I taught ballroom dancing for 4 years. It makes me wistful even just typing that because I desperately miss it. It was years ago that I taught (everything from the cha-cha to the tango to the waltz) and I stopped when I moved to San Francisco. I still miss wearing prim white gloves, sparkly silver shoes, and ultra-fancy dresses while whirling around the dance floor. I've been aching to get back into it, and it's definitely on my list of resolutions! 2. I am addicted to karaoke. I know, it's completely silly... but there are worse things to be addicted to! I've already mentioned a bit about my karaoke adventures on here before, but I figured it was worth repeating because I spend so much time doing it. In fact, a year ago I won a karaoke competition at a bowling alley (no joke) and won a trip to Las Vegas to compete in the International Karaoke Superstar Competition. I swear I couldn't possibly make up something that hilariously wonderful (and it was crazy wonderful, even though I knew I had no chance of winning it... but hey, free vacation!). 3. I will be 27 years old on March 15th of this year. I like getting older. I feel like I'm only getting closer to my true age, which usually hovers somewhere around 65, 70. And yes, I'm a Pisces through and through. 4. I have an older brother named Joey. He's 27 and about to move onto a sailboat with his girlfriend. 5. I've seen the movie Hairspray (the original John Waters version) more than any other movie. Troop Beverly Hills is a close second. When I was in 6th grade I watched Hairspray every single day after school. This lasted for an entire year. Every day, until I could recite the movie from heart and copy every single dance move. I'm sure this must have shaped me as a person in some strange way... maybe it's why I love 60's fashions and music so much. And why I have such a deep appreciation for kitsch. 6. I was born in Flint, Michigan but my parents moved the family to Northern California when I was only three weeks old. And it's a good thing because I can't imagine having grown up anywhere else. I will always be tied to Northern California and its redwood trees and foggy coasts. 7. I have lived in San Francisco for 8 years. I was always meant to live in San Francisco, I think. It feels like home. I could see myself living in other places in the future, but I'm certain I'll always end up back here. 8. The only thing I love collecting more than vintage clothing is books! As a fan of karaoke myself, I'd like to know your favorite karaoke jams :) And what you sang when you won the competition! Teach me how to ballroom dance! I will teach you how to dance like a free-spirited freak. haha. I liked learning that you have a brother who is about to move onto a sailboat with his gal! also, I love John Waters' "Harispray", but I may love "Cry Baby" just a tad bit more. Donut is so cute! Is he comfortable there? Great list! That's so neat you taught ballroom. Maybe we should do some guerilla ballroom at the Ritz! The first two are the most wonderful and surprising facts and I am in love with the idea of you doing those things. But I wonder this: how did you get into ballroom dancing? Are you a dancer? I mean, I guess that's two different questions already, but if I can ask a third, it would be this: what do you do for a living? Enjoy your adorable blog and cute sense of style. While I was checking out the picture of your cat, I noticed you have the pillowcase (and sheets??) that I had as a little girl! Serious deja vu, where did you find them? i loved reading this and more about you. also massive LOL @ your cat. you're so lucky to be living in SF! i'm going there for the first time in June and i cannot wait! This was so much fun to read! You've always struck me as a dancer (probably because you're tall, thin, and, graceful!) and so it makes a lot of sense that you'd teach ballroom dance. I have a book problem too... I tend to amass fiction more than anything else, although my recent forays into studying history have started to occupy ample bookshelf real estate. I'm hoping to oneday just decorate my walls with floor-to-ceiling bookshelves. Perhaps a bad idea in an earthquake, but so worth it. Thank you for this post! I've been following your online presence since I was 14 or 15 (you must have been 16 or 17 then). Back then you were on ashley.nu, had a bunch of photography (which I loved and followed fervently), a bio page, and soon after you were preparing to go to art school in San Francisco. 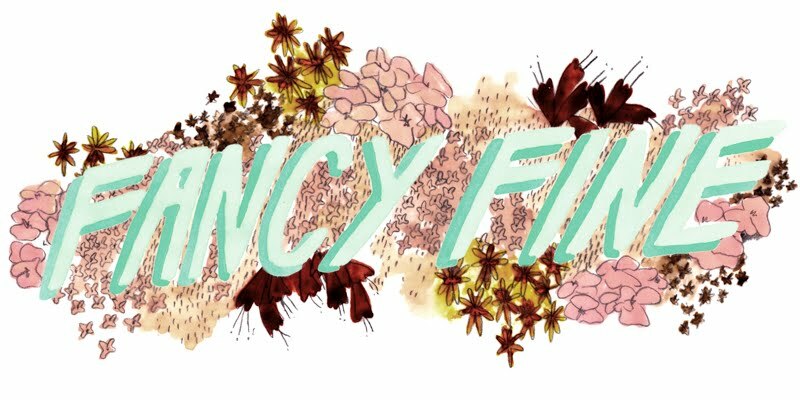 I lost track for a couple of years in between, but looked you up and started following Fancy Fine a few weeks ago. Trust me, you do have fans that care about the rest of your life! And I say that with hopefully the least bit of creepiness involved. Long story short, posts like this one are much appreciated. Donut sounds funny! My cat just likes to sleep in the back of the wardrobe wearing her fur coat, like Lucy in Narnia. I enjoyed reading the fun facts about you. I hope you post more things like this or the random tid-bits of your life. It one of the things I like reading about. I also have the same dresser as you. Had it since I was a little kid. 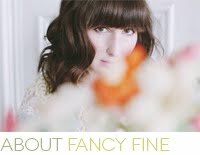 Ashley, your written musings are one of my (admittedly many) favorite parts of Fancy Fine! And knowing that you're also a literature-lovin'-lady just makes me adore you all the more. Donut is lookin super fly and fresh by that gnome up there. Is that your natural hair color or do you dye it? And yeah, i love books too. wow. Never thought there would be someone who watched Hairspray for like, 350 times, hahah! Thanks for this Ashley, it was great to know more about you. I am also a huge fan of karaoke, though I have trouble finding friends to go with. And our place is explosing with books as well, we have filled all four bookcases and have had to begin stacking. Have never been to San Francisco but I would love to - one day I am going to travel around the States by train, I swear it. ps Give Donut my love! Just discovered your blog and I am smitten! I, too am a huge karaoke fan (although not that great)! Looking forward to following you in the new year! wonderful list. I'm 27. It's not as tragic as it sounds. haha. that is crazy about how often you've seen Hairspray! I have seen it maybe 4 times and the new one 1 time. I was born on a 27 so it's my favourite number! I don't remember too much about being 27 years old, though. It was probably a-okay! Karaoke is amazing. No shame there. And I'm so glad you got out of Flint, because it is truly awful. My husband went to college there and though I love him so, I hated those trips. Awesome.I love the original hairspray. I saw in the theater with my mom when it came out. My every day after school movie was Beetle Juice though. My cousin and I had a I saw Beetle Juice more times than you contest. I'm pretty sure it had a deep effect on me. this post was just wonderful, and makes me feel less guilty for being a karaoke regular in my city. Cute girls can karaoke too! Donut does not look very comfortable. Funny cat. The Mitford sisters are fascinating to read about; they are/were all so different! I highly recommend The Mitford Girls by Mary S Lovell if you're going to read a biography of them all. It's so funny, I wrote a "few things" post too some days ago! I loved reading yours. Even funnier is that one of the things is San Francisco related! I have been reading Fancy Fine for just a long time one of my daily reads and I just realized that I dont think I have ever left a comment! When you mentioned "Hairspray" something inside me just clicked and I had to leave a comment. I was as obsessed with Hairspray as you were. I LOVE THAT MOVIE!! The John Waters version of course. I have seen that movie more than any other movie and I watch it for kicks so many times I know every song and dance move. It would be so cool to do a Hairspray inspired outfit and picture post. Great blog Ashley! As a recently transplanted San Franciscan your blog has definitely been a guide to the city! That looks like a great place for him to nap! You know how massage tables have that "donut" to stick your face through so that you can lie comfortably. he has figured out that he can stick his belly through that gap in furniture. Clever guy! Our kitties are like twins!! I'm going to go post a picture of my Lola on your fb page. So cute! I'm a pretty bad dancer and singer but I love to do both. haha. Sorry I missed karaoke but maybe next time. I've lived in San Francisco for 8 years too! Isn't it weird that we've only just met? We should start a book club! I love historical fiction and always have a pile of books waiting to be read. I love living next door to a library too. Heaven! cute kitty! what are your favorite things to buy when you're thrifting? do you have any tips of how to find good things in a thrift store? what is your favorite vintage find? What is your job and what did you go to school for? Another request for your favorite Karaoke songs to sing! I love singing karaoke too. They have it at a bowling alley here in town too! Wow. 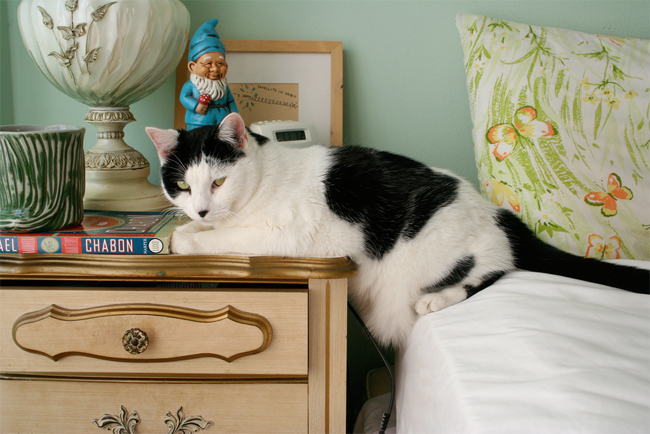 I Just wanted to point out that I own a dresser almost identical to the one with you cat in it! I almost couldn't believe it. It's sitting right next to me!